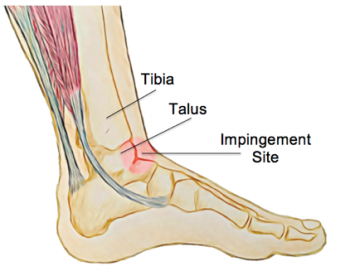 The most common risk factor for ankle impingement is a previous ankle sprain that was not adequately rehabilitated, as this can result in a stiff or unstable ankle. Another cause of impingement is the growth of small osteophytes or bony spurs around the ankle joint that press against the nearby soft tissues. These can be due to osteoarthritis or grow as a reaction to impingement itself. Training errors, muscle tightness, unsupportive footwear and a hypermobile ankle have also been shown to be risk factors for anterior ankle impingement. Depending on the cause, mild cases of anterior ankle impingement usually recover in one to two weeks with rest and physiotherapy intervention. For more severe impingement, the ankle may require up to six weeks of rest and rehabilitation to recover. In rare cases, surgical intervention will be required to remove any physical causes of impingement, such as osteophytes to restore impingement free movement of the ankle. Your physiotherapist will first identify the cause of your ankle impingement and help you to choose the best course of action to reduce your symptoms. They are able to advise you on the appropriate amount of rest and provide stretches and exercises to restore strength and flexibility to the ankle. Mobilization techniques and range of motion exercises can also reduce stiffness of the ankle, restoring normal joint movement. Moreover, balance and proprioception exercises are included to prevent further ankle injury. Balance exercises challenge the way your body reacts to outside forces. With this, your balance will be improved, and you’ll have a more stable ankle.